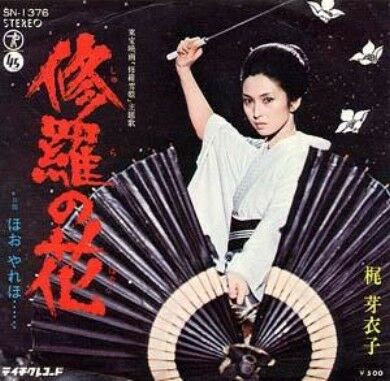 To commemorate House of Self-Indulgence's review of Itō Shunya's『女囚701号：さそり』("Joshū Nana-maru-ichi-gō: Sasori", "Female Convict 701: Scorpion"), here is a sampling of star Kaji Meiko's (梶芽衣子) singing. 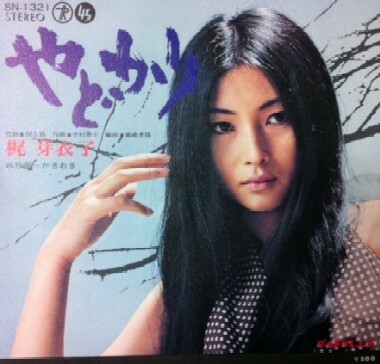 She released quite a few albums and singles over the years, mostly in the genre of enka (演歌, modern folk-songs) and 70s-style folk rock. Kaji is known for nihilistic glaring while wielding sharp objects in extremely compromising situations. While her most well known roles (Nami in the Sasori series, Yuki in Shura yukihime) have a lot of that, there was much more to the actress. She brought palpable intensity to her often silent performances, expressing great emotion masterful usage of body language and facial expression. In Sasori, there is a profound sense of isolation in Meiko's Nami. No matter what abuses she suffers, no matter how deep her pain, she somehow seems so far beyond it. As though her heart/mind is somehow untouched by all the abuse and pools of blood waded through. The depth of silent, endless steely rage that Kaji Meiko brought to the screen makes her singing that much more unique. Because she just feels.... awkward behind the microphone. Her voice isn't naturally strong (like The One True God in Heaven Togawa Jun). Instead, Meiko coos her way through lilting songs, trying her hardest not to break through..... There is a distinctly unsettling effect produced by the dissimilarity between the awkward charm of her recorded work and the striking isolation of her screen presence.